Okay, I’m a Texan boy…but I’ve been living in the Northeast U.S. for over 20 years now. 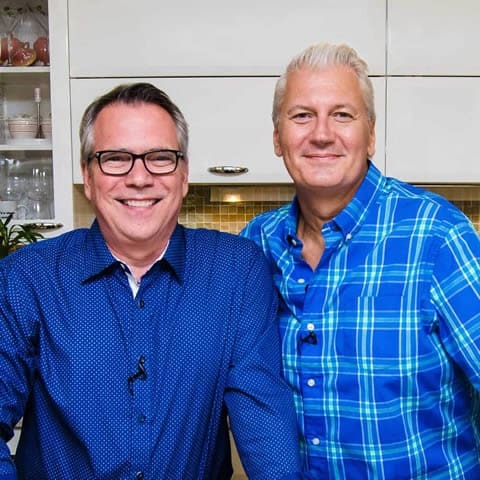 My cousin, Susan, lived in New Hampshire for a number of years, so I’ve had my fair share of good, New England cuisine. The Loon and I just love New England Clam Chowder (he’s not such a fan of the Manhattan Clam Chowder…I guess not creamy enough). Anyway, this is so good. Serve it with sourdough bread, and you’ll think you’ve died and either gone to Massachusetts or San Francisco. In this version, I make it with fresh clams. 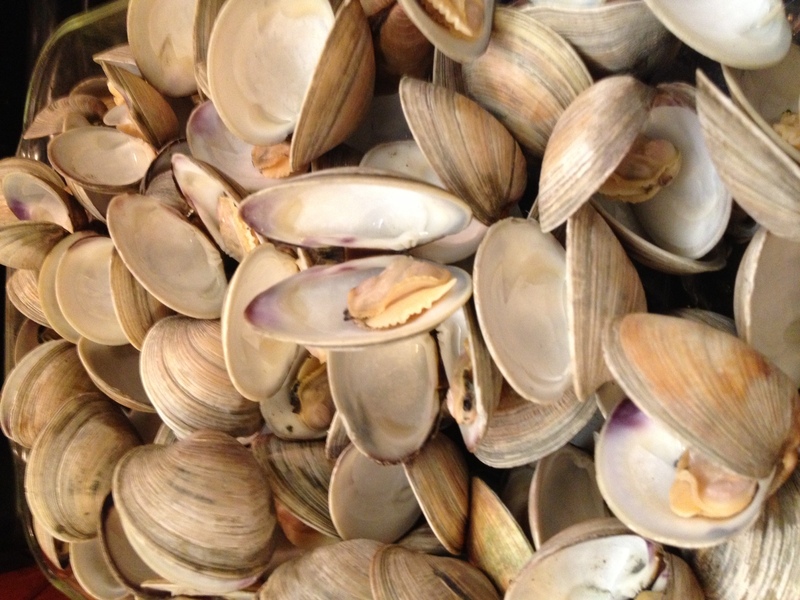 Of course, you can use canned clams…its still really, really good. 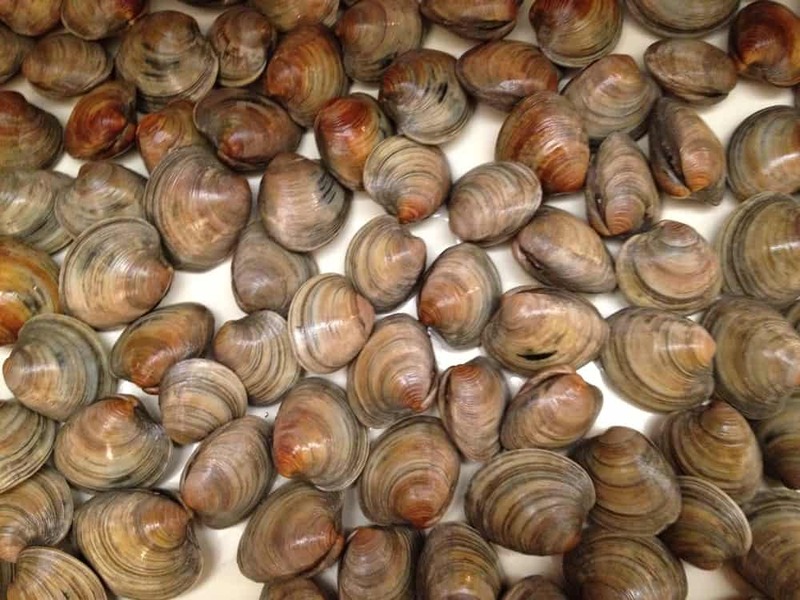 If you do use fresh (always my first choice)…I advise that you purchase some cheese cloth, or an extremely fine sieve, and make sure you strain you fresh clam stock, as well as the cooked clams, several times. Just to ensure your chowder is free of sand. 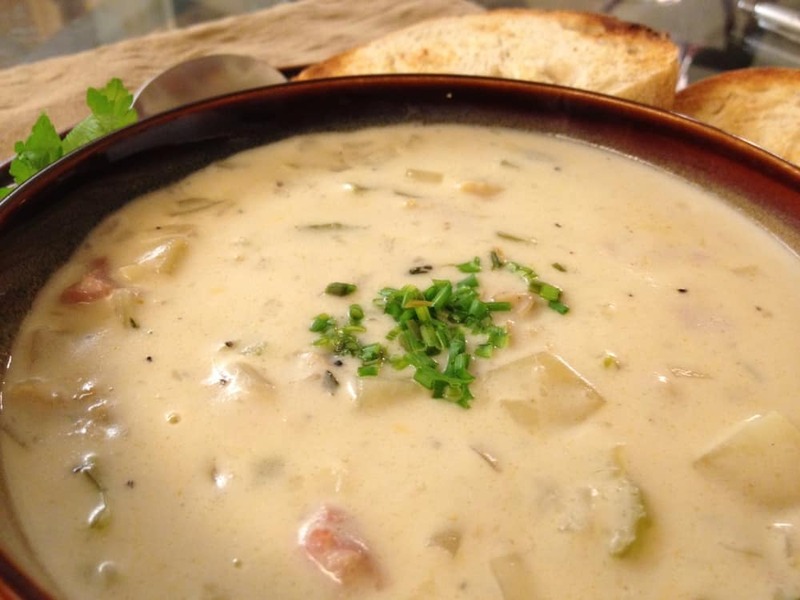 This soup is comfort at its best. 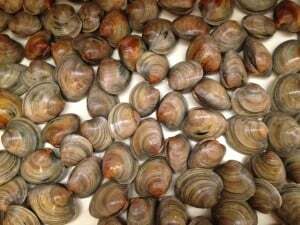 8 lbs littleneck clams (1 pound of clams equals about 12 to 14 clams) – thoroughly rinsed, scrubbed – any open clams – toss ‘em in the trash. In a large stock pot, bring about 4 cups of water to a boil. Add the clams and cover for 5 minutes. Stir with a wooden spoon. Cover for about 3 more minutes. Clams should have opened. 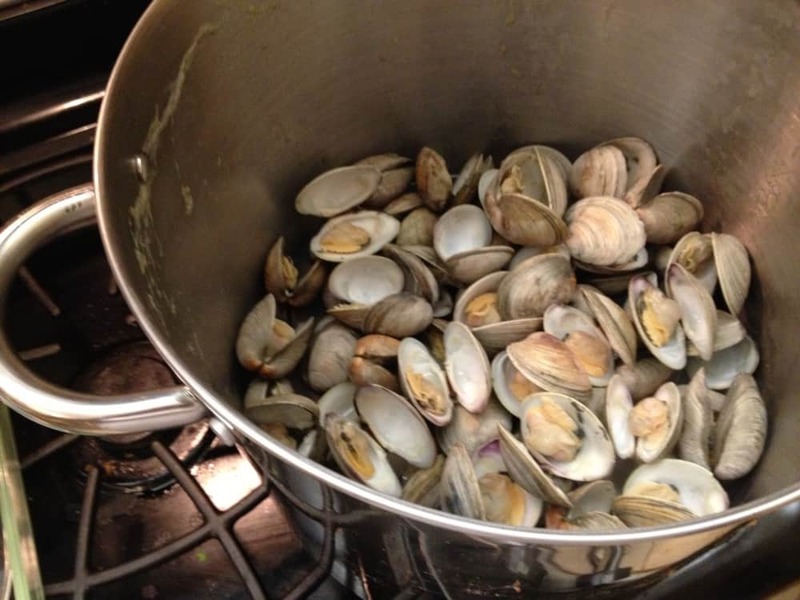 Transfer the cooked clams to a large dish. Strain the broth at least two times through cheese cloth into a large bowl, being careful to strain out the sand. This should leave you with about 6 cups of clam broth. If you are short, add bottled clam juice, or water. 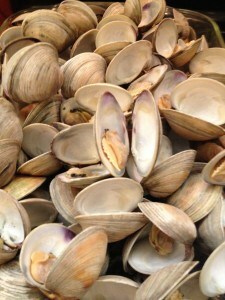 When the clams are cool enough to handle, remove them from their shells and chop into ½ inch pieces. Set clams and broth aside. In a large, heavy pot, cook the salt pork until slightly crisp. Add a little bacon fat, if you have any on hand. Then add the butter. If you don’t have any bacon fat, then add an extra pat of butter. 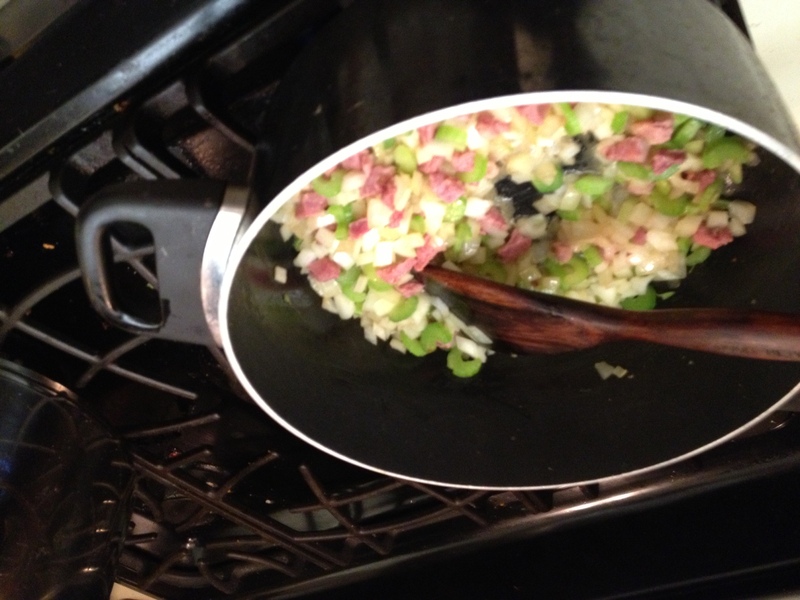 Add the onions and celery and cook until soft, about 5 minutes. Add the garlic, thyme and bay leave. About 3 minutes more. Add the flour, and stir, forming a roux. Add the potatoes and reserved clam broth and bring to a boil. Lower the heat, cover, and simmer for 30 minutes. Broth should thicken and potatoes should become very tender. Remove from heat, stir in clams, heavy cream, hot sauce, Worcestershire sauce, Sherry and salt and pepper to taste. Set aside for about an hour. 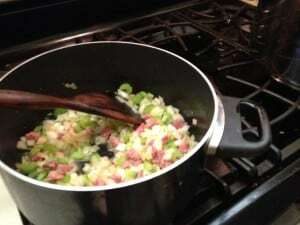 Then, place the pot over low heat, and slowly re-heat, but don’t bring to a boil Garnish with a couple pats of butter, and chives. 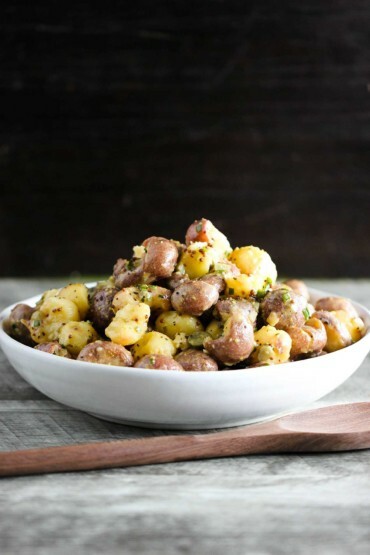 Serve with warm sourdough bread.